Shaheed Major Baldev Singh Ghuman, son of Sardar Bhim Singh Ghuman and Bibi Inder Kaur, was born on July 10, 1937 at village Muhadipur, District Sialkot (now in Pakistan). After the partition his father settled down at village Bhani Bhagar (near Qadian), district Gurdaspur and here Major Baldev Singh finished his education at Sikh National College Qadian under the one of the best educators; Head Master Sardar Karam Singh Ghuman, Head Master Santokh Singh Cheema and Principal Bawa Harkrishan Singh. In 1961 he joined the Indian Army and served in 4th Jat Battalion until he resigned as a Major in 1983. He participated in three Indian wars during 1962, 1965 and 1971 but was left saddened and shocked with the attack on Golden Temple by Indian Army in summer of 1984. After this incident he came under the influence of Damdami Taksal and started to work closely with Sardar Simranjit Singh Mann (MP) holding the position of senior member of Panjab State Working Committee within Akali Dall (Mann). Soon he became a highly active human rights activist by organizing peaceful protests against fake police encounters and torture of Sikhs. He is also credited for the unity between two major factions of Sikh Youth Federation and saving hundreds of innocent Sikh men from being engaged in fake encounters and torture during the dark days of Panjab in 1980’s. For his selfless service for Sikh panth and Panjabi people he was arrested on August 8th, 1986. 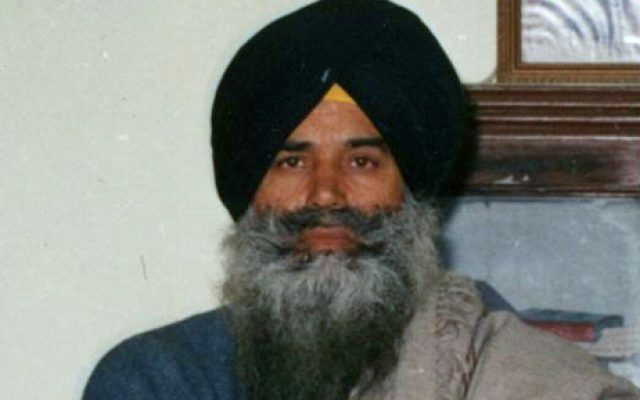 He was tortured in Jalandhar and Amritsar interrogation centers and later moved around in different jails of Panjab including Nabha, Sangrur and Patiala for two years, from were he was released after the court dismissed his case. His journey to jail and infliction of torture upon him made him stronger and he spoke out much louder against the human rights violations, which took place in Panjab. As a senior member of Akali Dall (Mann) his duties included to get innocent Sikh men out of the jails of Panjab and to retrieve dead bodies of Sikh men killed in encounters. His this activity did not seemed to make authorities and police too happy and he was shot dead on 23rd June, 1990 at his house in Jalandhar by police sponsored killers known as “cats”, so that the voice of the oppressed people can be brought down. People of his village and surrounding villages made a small memorial in his memory at gurdawara Tahli Sahib at village Ghorawaha, Gurdaspur were now Baba Darshan Singh Ji is running a Sikh academy and providing an opportunity for the children from surrounding villages to get basic education. A person is not dead until forgotten; Shaheed Major Baldev Singh Ghuman was a brave soldier who fought for his country, and people. Upon his death all political and human rights organizations of Panjab paid their homage and was declared a great martyr.